Functional Integrated Training is a body strength training class challenging muscle endurance, balance and coordination. Class provides a balanced workout between upper and lower body. Add segments of core training to strengthen abs and low back. Great music to keep motivated, build skill and coordination. 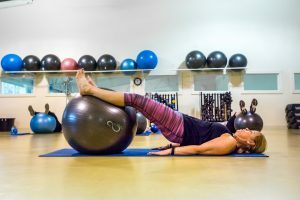 Class integrates stability balls, weights, body bars and tubes to achieve improved performance. Wear comfortable clothing, athletic shoe and bring water to maintain proper hydration.